Bliss Scaffold Division was formed in 1986 to run alongside the existing Brickwork Division and offer an in-house solution to our access requirements. Since this time, due to the efficient nature of combining the brickwork and scaffold packages, our Scaffold Division has evolved into an established leading scaffold contractor in its own right. Currently employing 30 scaffolders and 10 trainee scaffolders, along with professionally trained staff, we are fast securing our position as one of the regions largest scaffolding contractors, owning in excess of £ 1million of scaffold equipment, of which we own probably the largest amount of Kwikstage in the country. We offer a unique incentive for Contractors to employ Bliss on the basis of a combined brickwork and scaffold package by not applying any hire charges to the erected scaffold whilst only our bricklayers are working on it. Therefore it is quite usual for hire charges to only commence once the scaffold has reached roof level and been handed over for use by others, and in fact internal blockwork may never have hire charges applied if no follow on trades require its use. Dependent upon programme this may result in a saving of thousands of pounds in potential hire charges. The other advantage of the combined package is that we are responsible for our own access and this negates the risk for the Contractor with regards to any potential delays resulting in waiting time charges that may result. The close relationship between our Brickwork and Scaffold Divisions results in quicker response times and a more interactive relationship than the two. However, do not be misled into thinking we only provide scaffold for the brickwork access. 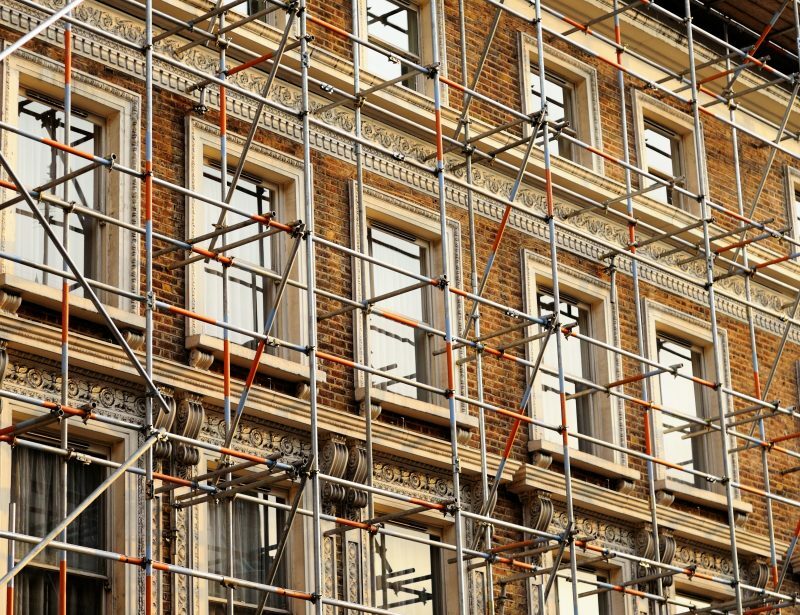 We are able to offer a fully independent scaffold service irrespective of whoever is carrying out the brickwork package. The Scaffold Division has recently become a member of the National Access & Scaffolding Confederation (NASC), which offers existing and potential clients the security that we always uphold best practice as professionals. The NASC operates a strict policy of full compliance to all new legislation and has its own code of conduct. By using NASC members you have the reassurance of well-trained experts working to the highest standards at all times. All our scaffolders hold CISRS and CSCS cards and in addition we also have certified forklift drivers and MEWP operators with CPCS cards. We offer tender stage advice, a full take off and scheduling service, design, budgeting and quotations, programming, as well as supply and erect of all your scaffold requirements. Our proven track record with major UK construction companies is testament to the first class service we provide on every contract. Bliss (subcontract Brickwork) Ltd was established in 1981 as a labour only brick work service. The Company expanded in 1986 and added a scaffolding division. Based in Northampton the company has achieved a steady growth over its 35 plus year existence, to become one of the leading brickwork and scaffold contractors in the Midlands, with a current turnover of approximately £7.5 million and growing, attributed to our commitment to providing a quality of service unrivalled within the industry.